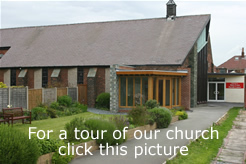 To be part of God's One Holy Catholic and Apostolic Church within the Church of England. We seek to promote the unity of creation, to be and do what God requires, to welcome all who will come and to share what we have received with those around us. *The full programme of activities taking place in our community centre can be found here...Something every day!..